Thanos — Marvel's Mad Titan — is featured here beholding his ultimate weapon — the Infinity Gauntlet. Thanos has become Marvel's biggest cosmic villain and is now a main character in the Marvel Cinematic Universe. From his first appearance in Iron Man #55, Thanos — created by Jim Starlin — has always sought power and dominance over the universe in his quest to capture the attention of Marvel's embodiment of Death. This intimidating statue is sculpted by Randy Bowen & The Shiflett Brothers, and stands 16" tall. 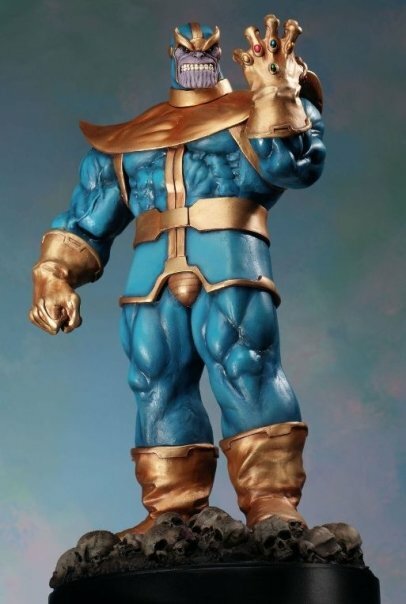 Own Thanos today before he conquers us all!